Dragonair in game: 586 Who? Important notice! Pokemon Dragonair is a fictional character of humans. Dragonair (Japanese: ハクリュー Hakuryu) is a Dragon-type Pokémon introduced in Generation I. It evolves from Dratini starting at level 30 and evolves into Dragonite starting at level 55. 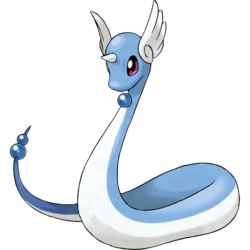 Dragonair is a long, serpentine Pokémon with sky blue scales and a white underside. Its violet eyes are dark and glossy. It has a smooth, rounded snout and a small, white horn on its forehead. Its head is flanked by two small, stylized wings, which are white and curve into a swirl at the base. Three blue, crystal orbs, one on its neck and two on its tail, adorn its body. Dragonair emits a gentle aura that gives it a mystical appearance. As seen in the anime, it can make its wings grow larger in order to fly, but otherwise moves through the air unaided. 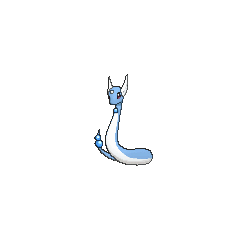 Dragonair hosts a large amount of energy within its body, which it can discharge through the crystal orbs on its neck and tail. This causes its body to brighten and give off a different aura that changes the weather in its vicinity. Dragonair is a rare Pokémon that inhabits seas and lakes. Clair's Dratini evolved into a Dragonair in Beauty is Skin Deep. 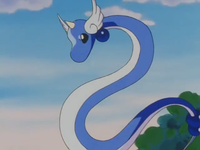 Dragonair first appeared in the banned episode, EP035, as a Dratini the warden of the Safari Zone was protecting. Over the 30 years since Kaiser last saw the elusive Dragon-type, it evolved into Dragonair. It also had a child Dratini. In On Olden Pond, a Dragonair was living in a lake that Mr. Saridakis once planned to build a luxury resort on. A Shiny Dragonair appeared in Master Class Choices! under the ownership of a Pokémon Performer named Amelia. 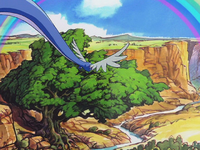 Dragonair briefly made its worldwide debut in Pikachu's Rescue Adventure, flying around the rainbow after the storm. A Dragonair appeared in Team Rocket's fantasy in Imitation Confrontation. Dragonair made its English dub debut in Dueling Heroes. EP035 Dragonair Ash's Pokédex Dragonair, the Dragon Pokémon. A Legendary Pokémon that can freely make it rain or snow. It's said to be able to fly even though it doesn't have wings. EP251 Dragonair Ash's Pokédex Dragonair, the Dragon Pokémon. Dragonair has the ability to manipulate the elements as it wishes. Dragonair debuts in Long Live the Nidoking! where it is seen as one of the Pokémon at Fuchsia City's Safari Zone. A Dragonair appeared with its Trainer in Just a Spearow Carrier at the Indigo Plateau. Lance owns two Dragonair, one of which he caught previously, the other stolen and brainwashed. The latter was sought by Yellow for surfing, as it was offered as a prize in a surfing contest in Breath of the Dragonair Part 1, the former first appeared in Extricated from Exeggutor. Many other Dragonair also make up the Dragon-type army together with his multiple Aerodactyl, together they were used to attack the mainlands of Kanto. They first appeared in Playing Horsea. Clair's Dragonair appeared in Debonaire Dragonair, where it was seen being used to battle Ryu's Seadra and win. It later cam with its Trainer to the Dragon's Den, where it battled and was defeated by Suicune. A Dragonair was one of the Pokémon sent to help the fight in Ilex Forest in The Last Battle XIII. A Dragonair belonging to Clair appeared in The Ultimate Battle…?!. In Pokémon Pocket Monsters, Professor Oak and Green mentioned that a Dragonair's orbs are worth 300 million yen each. 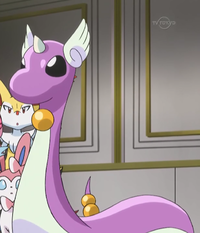 Dragonair appeared in a fantasy from Lance's Dragonite in The Final Battle!! when Dragonite was telling a false story about how it met Lance. Dragonair made an appearance in Good-Bye, Pikachu?! where it evolved from a Dratini. It managed to take out all of Giovanni's Pokémon. Dragonair evolved into a Dragonite when Clefairy pulled its tail. In Crystal Orb of Rainfall, Shu meets a Dragonair named Ryuko in the body of a human. He helps her find the blue orb she lost that used to be on her neck. Later in the manga, Shu captures a Dragonair of his own. A mystical Pokémon that exudes a gentle aura. Has the ability to change climate conditions. According to a witness, its body was surrounded by a strange aura that gave it a mystical look. Lives in large bodies of water like the sea and lakes. It is said to have the power to change the weather and fly. They say that if it emits an aura from its whole body, the weather will begin to change instantly. Its crystalline orbs appear to give this Pokémon the power to freely control the weather. It is called the divine Pokémon. When its entire body brightens slightly, the weather changes. A Dragonair stores an enormous amount of energy inside its body. It is said to alter the weather around it by loosing energy from the crystals on its neck and tail. It is said to live in seas and lakes. Even though it has no wings, it has been seen flying occasionally. If its body takes on an aura, the weather changes instantly. It is said to live in seas and lakes. Dragonair stores an enormous amount of energy inside its body. It is said to alter weather conditions in its vicinity by discharging energy from its crystals on its neck and tail. It has long been thought that its crystalline orbs are imbued with the power to control the weather. From time immemorial, it has been venerated by agricultural peoples as an entity able to control the weather. Moves marked with a superscript game abbreviation can only be bred onto Dragonair in that game. 51%-100% HP The sea and the sky... Both are my allies! 26%-50% HP This isn't good. I have only half my HP left. Level up I've leveled up. I'll make you believe in my power! It attacks by breathing blue flames. It also has a mysterious barrier for protection. Increases damage done by any Dragon types in a combo. 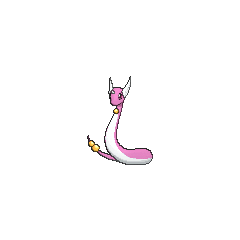 For other sprites and images, please see Dragonair images on the Bulbagarden Archives. In the Pokémon Red and Blue beta, Dragonair was originally known as "Dragyn". In Blackthorn City, a woman is willing to trade her RhydonGS or DodrioCHGSS for a female Dragonair. This makes Dragonair the only Pokémon able to be male or female that must be a specific gender for an in-game trade. In Pokémon Yellow, Dragonair's catch rate was changed from 45 to 27, making it the hardest Pokémon to catch in the Kanto Safari Zone. In the later games, the catch rate was changed back to 45. Dragonair is also the name of an airline based in Hong Kong, China in the real world. 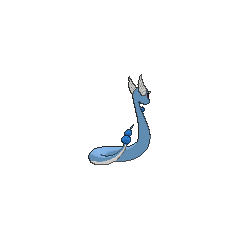 Dragonair and its evolutionary chain share their category name with Horsea, its evolutions, Salamence, and Goodra. They are all known as the Dragon Pokémon. It appears to be based on sea serpents or ryu, traditional Japanese dragons or Chinese dragons who bring good luck. It also appears to look like a snake, its tail even resembling that of a rattlesnake. The wings on its head resemble those on the sandals and hat of the Greek fake Hermes, and its long, snakelike body may be a reference to the snakes on his scepter. 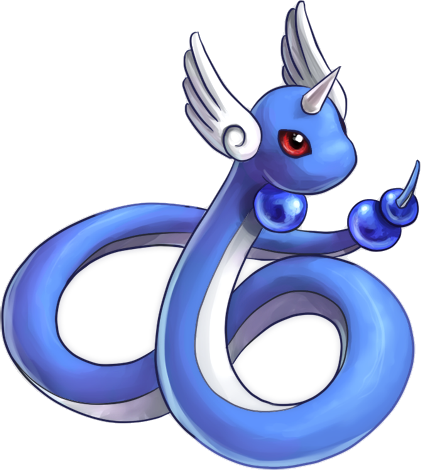 Dragonair may also be based on the imugi, a proto-dragon that resembles a snake and lives in water or caves, much like Dragonair. After an imugi lives a thousand years, a jewel (called a Yeouiju) will fall from the sky. If the imugi catches it, it will become a true dragon. The jewel on Dragonair's neck might also be a reference to the Japanese folktale, The Tale of the Bamboo Cutter, in which the princess Kaguya-hime challenges her suitors to bring her back some items, including a colored jewel from a dragon's neck. Dragonair may be a combination of dragon and air (referring to its ability to change the weather or to its air of grace and majesty) or debonair (referring to its graceful appearance and flying). It could also refer to a "lair", the traditional home of a dragon. Hakuryū could be taken to mean 白竜 (white dragon). Hakuryu was also the name of the dragon-like companion of Zhu Bajie/Cho Hakkai from the legend of the Journey to the West in Buddhist lore.